Alexander, Alan: NORTHLINE. Poems. Photographs by Victor France. Bruce, Mary Grant. Ills by John Lennox: A Little Bush Maid. BENN, Gottfried. SANDER, Volkmar (ed.). : Prose, Essays, Poems. 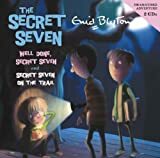 Well Done, Secret Seven: AND "Secret Seven on the Trail"